Residents of Bishkek yesterday flocked to the city’s main square to remember the dozens of people who died in Wednesday’s violence. But grief was tinged with anger at ousted President Kurmanbek Bakiyev, who authorised troops to shoot on demonstrating civilians. Mr Bakiyev fled to the south of the country as his government fell. Many in Bishkek hope that he, and his hated sons, will not return. The ousted president has denounced the revolution, which led to government offices being torched and looted, as a foreign-backed coup and told The Independent after fleeing that he still has the support of the majority of the country. However, the mood on the streets yesterday suggests that he is out of touch with a people furious at his authoritarianism, corruption and nepotism. More than anything, it was the catapulting of his sons and brothers into senior state positions that angered ordinary Kyrgyz. It is telling that while interim leader Roza Otunbayeva has said Mr Bakiyev will be guaranteed safe passage out of the country if he capitulates, no such offer has been extended to his family members. The country’s new prosecutor-general yesterday announced that a case was being prepared against Maxim Bakiyev, the president’s son and the most reviled man in the country. Aged 32, he was, many suspect, being groomed to succeed his father. He headed a specially created agency to manage the hundreds of millions of dollars of Russian loan money, called the Central Agency for the Development of Investment and Innovation. Critics noted that the Russian abbreviation for the agency sounded remarkably like “Tsar” – which is exactly what many in the country thought Mr Bakiyev behaved like. “Even in the name of this agency, the ambitions of the Bakiyev sons for power were clear,” said Daniil Kislov, the editor-in-chief of the respected Fergana.ru website. “They helped their father usurp power, and also seized various different businesses. Last December, Gennady Pavlyuk, a prominent Kyrgyz journalist who had often criticised the authorities, died after falling from an upper-storey apartment window on a trip to neighbouring Kazakhstan. Earlier last year, Medet Sardykulov, a former head of Mr Bakiyev’s administration, who had gone into opposition, was found dead in his car on the outskirts of Bishkek. One of Mr Bakiyev’s key platforms when he came to power in the so-called Tulip Revolution in 2005 was that he would end the nepotism with which the ousted Askar Akayev had ruled. But politics came full circle, and in recent months his opponents have accused his regime of being even more corrupt and authoritarian. In addition to Maxim, Mr Bakiyev’s other son, Marat, and three of his brothers all held senior positions in the government. After the uprising, Mr Bakiyev defended his family and insisted that he had put them in senior positions because of their experience. This is unlikely to placate his opponents. Prosecutors say they have testimony showing that it was he who ordered troops to fire on the protesters. Whether they will have the chance to prove this in court is unclear. Maxim Bakiyev is said to have departed for the United States shortly after the demonstrations started. The Death toll apparently has reached 79. Approximately 1,400 have been injured. 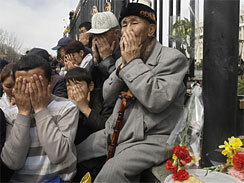 April 09, 2010 — Kyrgyzstan is holding a day of national mourning for the victims of bloody protests which ousted the government. The first funerals are being held for those who died in the unrest which forced President Kurmanbek Bakiyev to flee the capital. Mr Bakiyev has refused to resign but has offered to talk to the opposition, which has set up an interim government. 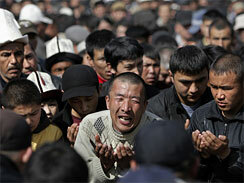 But interim leader Roza Otunbayeva has said she has no plans to negotiate with Mr Bakiyev and demanded he stand down. Both the US and Russia have key military bases in Kyrgyzstan, and are watching the situation there closely. The US says it has now resumed normal operations at its Manas base after military flights were suspended on Wednesday. The deputy head of the interim government, Almazbek Atambayev, has gone to Moscow “for talks on economic aid”, the government said in a statement.